Definition at line 27 of file CLText.h. Definition at line 41 of file CLText.h. Definition at line 34 of file CLText.h. Definition at line 48 of file CLText.h. Definition at line 16 of file CLText.cpp. Definition at line 37 of file CLText.cpp. Definition at line 58 of file CLText.cpp. Definition at line 79 of file CLText.cpp. References CKeyFactory::add(), ANCHOR_BOTTOM, ANCHOR_END, ANCHOR_MIDDLE, ANCHOR_START, ANCHOR_TOP, ANCHOR_UNSET, CCopasiRootContainer::getKeyFactory(), mKey, setFontStyle(), setFontWeight(), setTextAnchor(), setVTextAnchor(), STYLE_ITALIC, STYLE_NORMAL, STYLE_UNSET, WEIGHT_BOLD, WEIGHT_NORMAL, and WEIGHT_UNSET. Definition at line 164 of file CLText.cpp. Definition at line 302 of file CLText.cpp. Referenced by getFont(), CLLayoutRenderer::getFontSpec(), and toSBML(). Definition at line 318 of file CLText.cpp. Referenced by getFont(), and CLLayoutRenderer::getFontSpec(). Definition at line 310 of file CLText.cpp. Definition at line 334 of file CLText.cpp. Definition at line 326 of file CLText.cpp. Definition at line 430 of file CLText.cpp. Returns the text for the text element. Definition at line 358 of file CLText.cpp. Referenced by fillItemFromText(), toSBML(), and CLLayoutRenderer::update_textures_and_colors(). Definition at line 342 of file CLText.cpp. Referenced by adjustPosition(), and toSBML(). Returns the vertical text anchor. Definition at line 350 of file CLText.cpp. Definition at line 206 of file CLText.cpp. Referenced by CLLayoutRenderer::draw_text(), fillItemFromText(), and CCopasiXML::saveRenderTextElement(). Definition at line 230 of file CLText.cpp. Definition at line 214 of file CLText.cpp. Definition at line 238 of file CLText.cpp. Definition at line 222 of file CLText.cpp. Referenced by CLLayoutRenderer::draw_text(), and CCopasiXML::saveRenderTextElement(). Definition at line 246 of file CLText.cpp. Returns true if the font family has been set or false otherwise. Definition at line 382 of file CLText.cpp. Returns true if the font size has been set or false otherwise. Definition at line 390 of file CLText.cpp. References CLRelAbsVector::getAbsoluteValue(), CLRelAbsVector::getRelativeValue(), and mFontSize. Returns true if the font style has been set or false otherwise. Definition at line 406 of file CLText.cpp. Returns true if the font weight has been set or false otherwise. Definition at line 398 of file CLText.cpp. Returns true if the text is set to something else than the empty string. Definition at line 374 of file CLText.cpp. Returns true if the horizonal alignment attribute has been set. Definition at line 414 of file CLText.cpp. Returns true if the vertical alignment attribute has been set. Definition at line 422 of file CLText.cpp. Definition at line 172 of file CLText.cpp. Definition at line 254 of file CLText.cpp. Definition at line 262 of file CLText.cpp. Definition at line 278 of file CLText.cpp. Referenced by CLText(), and CCopasiXMLParser::TextElement::start(). Definition at line 270 of file CLText.cpp. Sets the text for the text element. Definition at line 366 of file CLText.cpp. Definition at line 286 of file CLText.cpp. Sets the vertical text anchor. Definition at line 294 of file CLText.cpp. Definition at line 182 of file CLText.cpp. Definition at line 190 of file CLText.cpp. 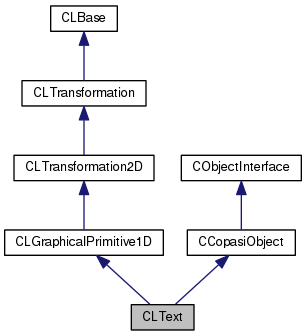 Definition at line 198 of file CLText.cpp. Definition at line 438 of file CLText.cpp. References CLGraphicalPrimitive1D::addSBMLAttributes(), ANCHOR_BOTTOM, ANCHOR_END, ANCHOR_MIDDLE, ANCHOR_UNSET, getFontFamily(), getFontStyle(), getFontWeight(), getText(), getTextAnchor(), getVTextAnchor(), mFontSize, mX, mY, mZ, STYLE_ITALIC, STYLE_UNSET, CLRelAbsVector::toSBML(), WEIGHT_BOLD, and WEIGHT_UNSET. Definition at line 62 of file CLText.h. Referenced by getFontFamily(), isSetFontFamily(), and setFontFamily(). Definition at line 63 of file CLText.h. Referenced by getFontSize(), isSetFontSize(), setFontSize(), and toSBML(). Definition at line 65 of file CLText.h. Referenced by getFontStyle(), isSetFontStyle(), and setFontStyle(). Definition at line 64 of file CLText.h. Referenced by getFontWeight(), isSetFontWeight(), and setFontWeight(). Definition at line 73 of file CLText.h. Referenced by CLText(), getKey(), and ~CLText(). Definition at line 68 of file CLText.h. Referenced by getText(), isSetText(), and setText(). Definition at line 66 of file CLText.h. Referenced by getTextAnchor(), isSetTextAnchor(), and setTextAnchor(). Definition at line 67 of file CLText.h. Referenced by getVTextAnchor(), isSetVTextAnchor(), and setVTextAnchor(). Definition at line 59 of file CLText.h. Definition at line 60 of file CLText.h. Definition at line 61 of file CLText.h.